The Milwaukee Brewers finally got a strong outing from starting pitcher Matt Garza. He allowed a run on four hits in six innings as the Brewers knocked off the Cincinnati Reds 9-1. Jim Henderson, Tyler Thornburg, Zach Duke and Rob Wooten combined to pitch the final three innings of scoreless relief against the Reds to complete the solid pitching effort. Jonathan Lucroy homered and drove in three runs and Logan Schaefer and Lyke Overbay each had a pair of doubles. The Brewers have the day off today. Even though 1st baseman Juan Francisco had a good spring offensively, he’s a liability on defense. Even though no official word was issued by the Brewers on Francisco’s status, his locker was cleaned out yesterday, apparently leaving the first base job to Lyle Overbay and Mark Reynolds. Juan Francisco hit two home runs as the Milwaukee Brewers opened Cactus League play with an 11-3 win over the Oakland A’s in Phoenix. Braun hit an 0-1 pitch from A’s starter Tommy Milone over the fence in the left-field corner to put the Brewers on top. It was Braun’s first appearance since serving a 65-game suspension. His last home run came May 22 in a 9-2 loss to the Los Angeles Dodgers at Miller Park. Braun played defensively in right field but didn’t see any action. The Milwaukee Brewers signed veteran Lyle Overbay to a minor league contract with an invitation to spring training. Overbay will turn 37 in a week. 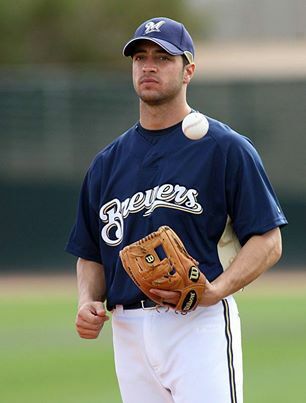 He started at first base for the Brewers back in 2004 and 2005. Overbay played last season with the New York Yankees and hit .240 with 14 home runs and 59 RBI in 142 games. The signing of Overbay comes after the Brewers added Mark Reynolds, who became a Yankees teammate of Overbay’s last August after being released by Cleveland. In 2004, Overbay set the Brewers’ record with 53 doubles. In two seasons with the team, he hit a combined .289 with 35 home runs and 87 doubles. There’s a chance Overbay and Reynolds could platoon at first base, leaving Francisco on the outside looking in. The Milwaukee Brewers announced the signing of veteran infielder Mark Reynolds to a minor-league deal with an invitation to major-league spring training. The Milwaukee Journal Sentinel first reported the potential for a deal on Thursday. The Brewers were looking for help at first base after losing Corey Hart in free agency to Seattle. Reynolds started in the majors at third base but as his career has progressed, he’s seen more time at first base. Reynolds hit .220 with 21 home runs and 67 rbi’s in 135 games for the Cleveland Indians and New York Yankees last season. Reynolds strikes out a lot. He set the major league record with 223 strikeouts with Arizona in 2009 and has struck out more than 200 times two other times. In 3,418 career at-bats, Reynolds has struck out 1,276 times while hitting 202 home runs. If Reynolds makes the team, he could platoon with the left-handed hitting Juan Francisco at first base. He could also provide some insurance at third base for Aramis Ramirez, who dealt with injury problems last season. The Milwaukee Brewers jumped out in front 5-4 in the 7th on a home run by Aramis Ramirez but they couldn’t hold it, falling to the St. Louis Cardinals 8-5 in the series opener at Miller Park. The Cardinals answered with 4-runs in the 8th inning, sending the Brewers to another loss. St. Louis not only won for the 9th time in 11 games overall, but for the 9th time in 11 games against the Cardinals this season. Brandon Kintzler gave up 5-straight singles in the 8th as the Cardinals came back. With the win, the Cardinals stay just 1-game behind the Pittsburgh Pirates in the Central Division title race. Manager Ron Roenicke turned 57 years old on Monday. Juan Francisco struck out 4 times for the second straight game last night. He became just the third player in the majors to do that this season. So far on the home stand, Francisco is 1 for 17 with 13 strikeouts. Kyle Lohse (8-8, 3.17) pitches against his former team tonight. The Cardinals counter with Lance Lynn (13-6, 3.89). Tyler Thornburg made another pitch to stay in the Brewers starting rotation, allowing 1 unearned run in 6-innings in a 5-4 loss to the Texas Rangers. The Brewers bullpen, normally very reliable, couldn’t hold the lead. The Brewers bullpen walked three batters to start the 7th inning and all three scored to give the Rangers the come from behind win. Texas had been 7-40 when trailing after 6-innings. It’s the 12th win in the last 14 games for the red-hot Rangers. Juan Francisco clubbed a pair of home runs, driving in all four Brewer runs in the loss. The Brewers have played 16 of their last 19 games on the road. They’ll return to Milwaukee to open a 4-game series against the Cincinnati Reds at Miller Park tonight. Tim Lincecum tossed 8-innings of 1-hit ball, leading the San Francisco Giants to a 4-1 win over the Milwaukee Brewers. The win gave the Giants a split of the 4-game series. Lincecum’s only blemish came on Juan Francisco’s 3rd inning leadoff double. The only other Brewer to reach base was Jeff Bianchi, who walked in the 6th. Brandon Belt clubbed a 3-run home run in the 1st inning off the Brewers starter and loser Donovan Hand. Hand has now given up six home runs in his last three starts. Lincecum struck out eight and walked one in the victory. The Brewers scored their only run in the 9th when Jean Segura singled home Khris Davis, who doubled to lead off the inning. The Brewers now head to Seattle to face the Mariners tonight. Kyle Lohse (7-7, 3.23) pitches for Milwaukee. Joe Saunders (10-10, 4.58) goes for Seattle. Infielder Scooter Gennett will rejoin the Brewers in Seattle tonight. He’s been recalled from Triple A – Nashville after the Brewers placed Rickie Weeks on the 15-day disabled list with a hamstring injury. The Milwaukee Brewers wasted another solid pitching performance by Tyler Thornburg, falling to the San Francisco Giants 4-2 in San Francisco on Monday night. Thornburg worked six solid innings, allowing just 1 unearned run for his second straight solid outing. Unfortunately, the Brewers train derailed in the 8th inning. The final blow came when Jeff Bianchi booted a routine ground ball that turned into a pair of runs and a loss. Juan Francisco homered in the loss as the Brewers have dropped 4 of their last 5 games. Game 2 of the series is tonight. The Milwaukee Brewers jumped out to a 6-0 lead and went on to knock off the Colorado Rockies 7-5 on Saturday night at Coors Field in Denver. Tom Gorzelanny threw five scoreless innings for the Brewers before running into trouble in the sixth. He allowed a run scoring single to Troy Tulowitzki, then walked Michael Cuddyer. Rockies catcher Willin Rosario followed with a three-run homer, which led to a trip to the showers for Gorzelanny. The Brewers made it 7-4 in the 7th with Jonathan Lucroy’s 15th homer of the season. Troy Tulowitzki bounced back with a homer in the 8th to give the Rockies their final run. Juan Francisco hit his 13th home run of the season in the 3rd inning for the Brewers. The game was delayed for an hour and 45 minutes in the 9th. Brewers shortstop Jean Segura was hit on the forearm by a pitch and eventually was removed from the game.